Save 750 megawatt hour a year using BLACKLE=GOOGLE!! A few months ago, TreeHugger Mark Ontkush wrote a post on his blog EcoIron titled 'Black Google Would Save 750 Megawatt-hours a Year'. The post lays out the following train of thought. "An all white web page uses about 74watts to display, while an all black page uses only 59 watts." Google,which has a white background and gets about "200 million queries a day" could reduce global energy use by 750 Megawatt-hours a year by simply changing the color of its homepage to black. In response to this factor A black version of Google emerged called BLACKLE. According to Blackle's homepage at publication time, 4,408.917 Watt hours have been saved . The site encourages users to "make a difference today by ... Blackling "energy saving tips" or visiting TREEHUGGER, a great blog dedicated to environmental awareness." Nice ideas. But how does the search measure up? Very well indeed. Give it a whirl yourself and start saving energy one search at a time. Nano Pacemakers! Application of Nano Technology! If you think of technology from the beginning to this day, It aheads towards miniaturization, We want everything, every work to be done within our palms! There is no more Moore's Law, Its Nanotechnology. One fine sunny day, I, my three friends(phaneendra, Varun, Kunal) thought to do research and publish a research paper on Nanotechnology. But we didnt knew how transistor were fabricated on a processor at present , I mean in micro world. Well when i was in 12th I had read an article on Times of India(newspaper) about "sood effect" and also it mentioned a book on nanotechnology " Nano- The next Revolution --by Mohan Sundara Rajan". The first thing i did was saving money for this book. I use to ask my mom money for eating outside(hangout) and i use to save them for this book. Then finally i had money, I went to sapna book house in jayanagar and bought it, I read the book that night and finished it, Thats an awesome book for beginners ! I mean if you want to know what nanotechnology is then thats a good book for you. We all four thought of meeting in cafe coffeeday in jayanagar 4th block and do research!!! This may sound crazy! but we didnt have any place else! All were telling us to focus on scoring and getting good marks... we didnt believe in academics! So where ever we use to go people use to spy on us and irritate us! it was frustrating! So Cafe Coffeeday was a good place for us. So we got our laptop's in and accessed wifi and started our research we googled for a lot of things. Suddenly I thought of an article on newspaper! It was on PACEMAKERS. So i thought of applying nanotechnology to PACEMAKERS. Well at sudden we all went blank. I thought for a few seconds and deep in my memory lane was this book "Nano - the next Revolution", I had read about SOOD EFFECT. So what exactly is Sood Effect??? When you pass liquid through a nanosensor or nanotubes electricity is produced! This was shown and demonstrated by IISC Scientists. Here is a small snapshot of the article in that newspaper long ago!!! Well our idea is to use this Sood Effect to Pacemakers. There is one problem in Pacemakers, its the battery! so instead of replacing the battery using blood as a liquid, electricity can be produced which makes pacemaker working and run smoothely for years without any replacement or change of battery. So actually We published this paper in our college! The title for this research paper is "Novel Approach to futuristic Pacemakers" This was given by our director, He helped us a lot with respect to grammer and writing stuff! Well People read "Nano-- the next revolution-- by mohan sundara rajan" I hope you will get an innovative idea to change the world and help people through Technology! Management is nothing more than motivating other people------ " Lee iacocca"
Well How can a human be a phoenix or even has the power of phoenix? (Rising from ashes!!!!). You got to ask Lee Iacocca for the answer. 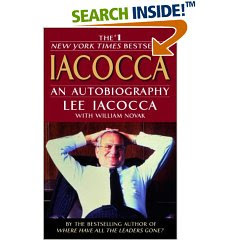 Lee Iacocca spent 38 years in automobile industry, He worked as a employee in FORD for 30 years and then he became the president of FORD for another 8 years. But suddenly his fate told him " Wait we are not finished with you, now you are going to find out what it feels like to get kicked off Mt. Everest". So he was fired from FORD on july 13 1978. This was just a prologue! Read his autobiography its very inspiring!